The family of at-risk missing person, Adriana Monique DeJesus, would like to thank the public for their assistance in locating Ms. DeJesus. Adriana's family notified the Los Angeles County Sheriff's Department today that Adriana was located uninjured, on Sunday, March 25, 2018. 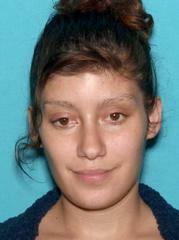 Detectives from the Los Angeles County Sheriff’s Department Missing Persons Unit are seeking the public’s assistance in locating Adriana Monique DeJesus, a 23-year-old Hispanic woman with the mental capacity of a 10-year-old, who is also partially blind. 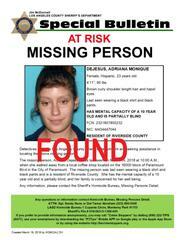 She was last seen walking away from a local coffee shop, located in the 1600 block of Paramount Boulevard in the city of Paramount, on Monday, March 19, 2018, at approximately 10:00 A.M.
Adriana, a resident of Riverside County, is described as 4’11” tall, weighs 90 pounds, has brown curly shoulder length hair, and hazel eyes. She was last seen wearing a black shirt, and black pants. Adriana Monique DeJesus’s family is very concerned for her well-being and is asking for the public’s assistance in her safe return. Anyone with information about this incident is encouraged to contact the Los Angeles County Sheriff's Department's Missing Persons Unit, Detective Abraham or Sergeant Nava at (323) 890-5500. If you prefer to provide information anonymously, you may call "Crime Stoppers" by dialing (800) 222-TIPS (8477), use your smartphone by downloading the “P3 Tips” Mobile APP on Google play or the Apple App Store or by using the website http://lacrimestoppers.org.